A plaque in the Toujouse Bar in The Tremont House shares a little history on the historic bar. It reads, “The year was 1872 and in the bustling port city of Galveston, young Henry Toujouse recently arrived from France. He found work at the Opera House Saloon situated in the basement of The Tremont Opera House at Tremont and Market. From behind the beautiful rosewood bar, Toujouse observed Galveston’s businessmen and gilded youth who regularly met at the opera house saloon. When the original proprietor died, Toujouse took over the saloon business and managed it until the opera house was sold in 1894. He then moved across Tremont Street opening First Henry’s Café in the Stag Hotel. With him went the elaborately ornamented bar. In 1913, Henry sold his hotel and retired. What fate befell his beautiful bar for the next half-century is unknown. In the late 1960s it was found unpolished and scarred but still serving its purpose at the 7th Street Tavern. Eventually, the bar was purchased and later donated to the Galveston Historical Foundation. 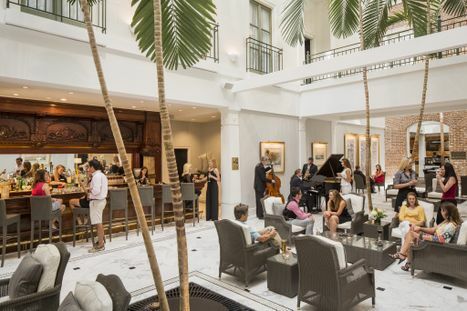 Today leased from the Galveston Historical Foundation and restored to its original beauty Henry Toujouse magnificent rosewood bar once more serves its purpose this time in the atrium of The Tremont House in the bar named in his memory. The hotel’s historic Toujouse Bar is open daily from 2 p.m. to 12 a.m.Monday through Thursdays, noon. to 1 a.m. Fridays and Saturdays and noon to midnight Sundays. Guests can enjoy live entertainment by Trio du Jour Fridays and Saturdays from 6 to 10 p.m. The bar specializes in martinis, single-malt scotches and small-batch bourbons as well as top brands of beer and wine. The Toujouse Bar at The Tremont House hosts a Jazz Series on Friday and Saturday evenings. Photo by Terry Vine.